You’ve heard of or at least seen the super popular hair ties that started from Emi-Jay. Emi-Jay is a company that started because two teenage girls had a great idea (hair ties) and they blew up huge. Celebrities started wearing them and boom, huge success. I had to know what all the fuss was about so I ordered some from their website. A package of 5 hair ties of solid colors runs about $11 but the shipping was $10 per pack, since I ordered two packages I paid over $40. WTH. I received the ties and tried them out and they are pretty awesome. Definitely not 40 bucks worth of awesome. 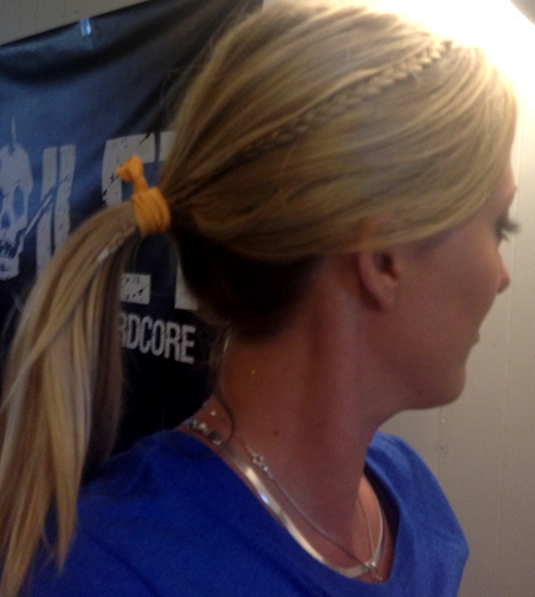 I found the same hair ties for one dollar at Walmart so of course I had to try those out as well. I didn’t notice a difference. They are pretty much the same. The one big difference besides the price is just that on Emi-Jay.com you have a selection of colors and prints. I’ve started to see these come out all over the place from Etsy sellers to Anthropologie. All for around the same price. 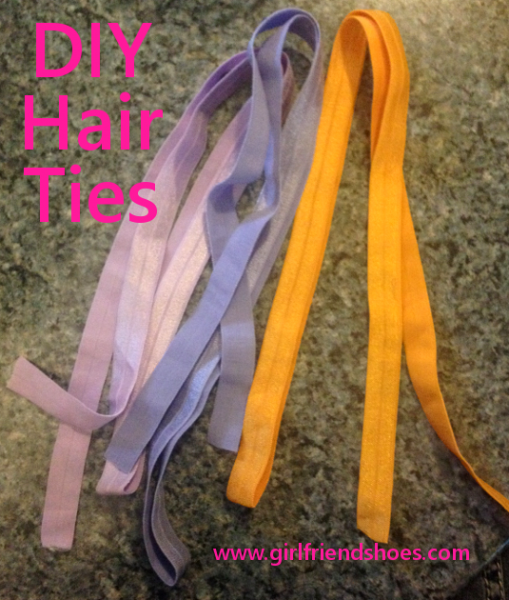 So then I�looked up how to make hair ties�and decided to make my own. For .50 cents a yard!!! 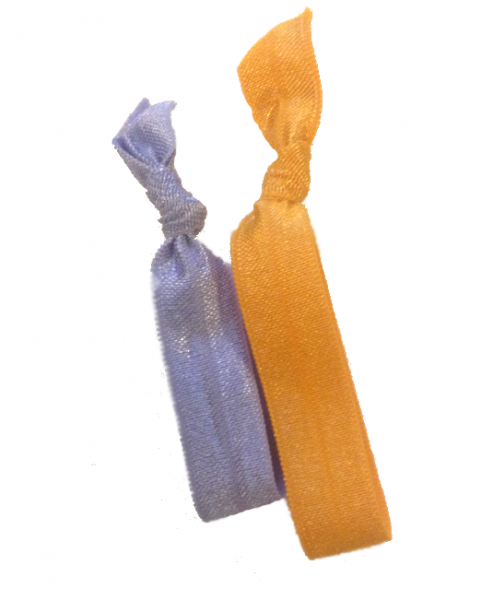 I bought three colors of the fold over elastic, periwinkle, lavender and gold and it cost me $1.50. I think it was like 5 bucks with shipping. I also decided to try different sizes. Why are these hair ties so great? Because they look great and don’t pull at your hair. No ripping. Also, less crinkle when you take your hair out of the hair elastics. Sometimes even, no kink in your hair at all. 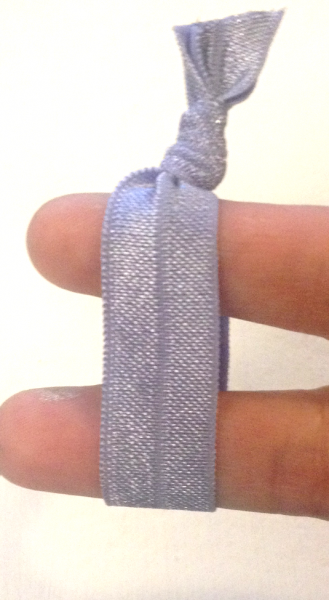 Cut the elastic to desired length, fold in half and tie. Easy Peasy! The ends will fray though if you don’t put something on them. I suggest clear nail polish but if you have a better suggestion I’d love to hear it. I’ve noticed now that these are starting to have beads on them, one big pretty bead mainly. I found one of these at a store in my local mall and although it is pretty I’m going to stick with the plain elastic hair ties for the no rippage benefit. Have you tried these hair ties? Would you like to? Just so happens that I have an extra Emi-Jay package to give away. Stay tuned, lots of giveaways coming up in early Aug. If you don’t want to miss any of the give a ways, make sure to subscribe to my newsletter for dates and details.